Our highly qualified and experienced dispensing Opticians at Silverman Opticians provide detailed unbiased advice on progressive, varifocal spectacle lenses without obligation or pressure. The Varilux varifocal range is extremely extensive to suit most patients’ budgets and requirements. 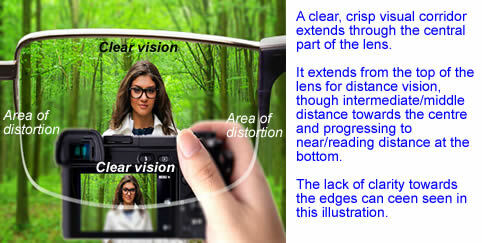 Their lenses are available in all refractive indices, with several different coatings, and Transition VI technology. The latest Varilux S series range from Essilor provides the widest corridors yet and can be ordered with Eye code for an individually tailored lens. At Silverma Opticians we have a special Visi-Office machine to order lenses with ‘Eye code’. Eyecode is a unique breakthrough in lens personalisation and is at the forefront of innovation. Currently, all lenses that are manufactured assume every person has the same Eye Rotation Centre (ERC), when in fact it can vary by 30%. The dynamic 3D measurements, which can only be measured by Essilor’s Visioffice system, is based on pinpointing the exact Eye Rotation Centre that is unique to every person, delivering a truly tailored eye diagnosis, that is quick, easy to determine and highly accurate.